EV Sales Blog did again a tremendous job to collect all available sales data from Europe, thanks to which we can see what is going on. There are probably still some very small bugs because different sources represent registrations, while other sources report sales. However, accuracy should be sufficient for a quick analysis. First of all we see near 8,500 sales in June, which is more than an 80% increase year-over-year, and roughly 44,000 sales in the first half of the year. Some 13,000 of all sales belong to plug-in hybrids, which means that two-thirds of sales must be all-electric. 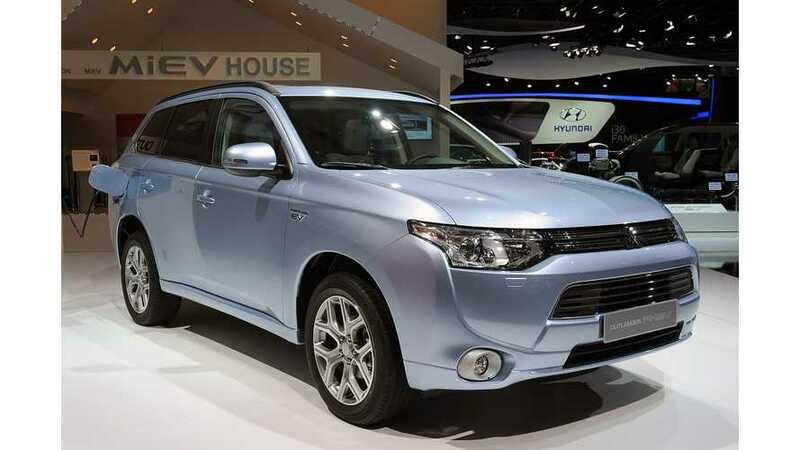 However PHEVs have Mitsubishi Outlander PHEV on-board and it's #1 in the rankings. "For the first time this year, four cars sold in the thousands, with the aforementioned Outlander PHEV and Nissan Leaf being two of them, but also the Tesla Model S (1.135 units) and the Renault Zoe (1.016) did it, a special mention for the french hatch performance, since it's only the third time it reaches this kind of sales, and it had been twelve months since the last time it did (1.358 units in June '13), this brilliant performance allowed it to jump two positions in the YTD ranking to #5 and it's now with eyes set on the BMW i3 to reach #4 and recover the B-Segment leadership." Two all-electric models (Nissan LEAF and Tesla Model S) complement the podium. 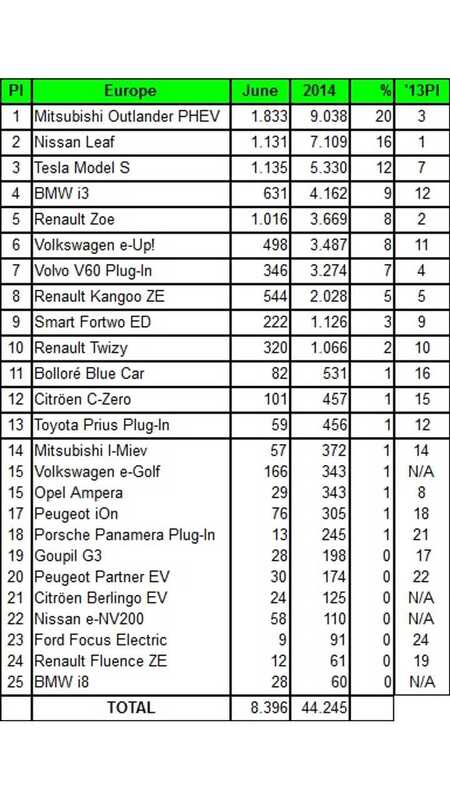 In all-electric ranking, just like we found earlier, Nissan LEAF is ahead of Tesla Model S and Renault ZOE. 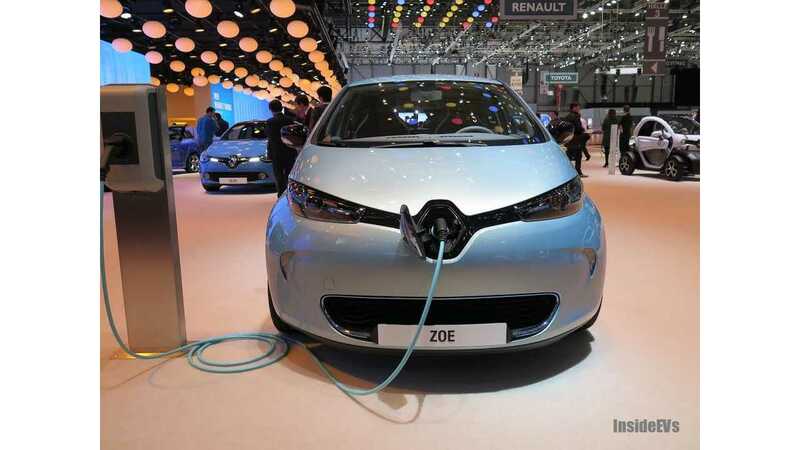 The Renault ZOE is gaining momentum and is ahead of the all-electric BMW i3 (in the table BMW i3 is few hundred higher after including REx). Volkswagen e-up! is lurking behind ZOE and the all-electric i3 is fifth, so bring more popcorn for a battle in the second half of the year. Just 4 more models exceeded the mark of 1,000 units in six months. Volvo V60 Plug-In, Renault Kangoo Z.E., electric smart and Renault Twizy, which is of course is not full size car. Funny thing is that the Renault Fluence Z.E. is ahead of the BMW i8, but that likely won't last for long. Maintaining some degree of tolerance for numbers, feel free to add your own insights.